The other night I had some friends over. I was doing nibbles, someone brought apps and another brought salad, and someone else baked brownies for dessert. When I rolled out my chips and dips there was cheering and whooping like I’d never heard before. What’s all the fuss about? Heluva Good Dip, that’s what all the fuss was about! I’ve never seen such excitement before about some nibbles. “Get some more chips so we can dip more,” say my friends. 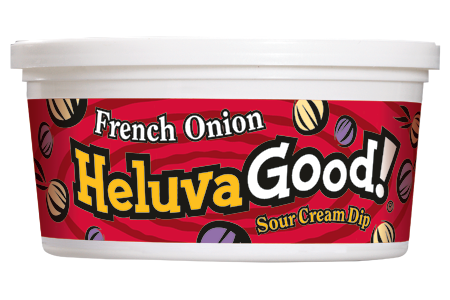 Now, being a Brit in the USA I had not come across Heluva Good Dips before, but apparently they’re “the best” according to my American chums. “The French Onion is to die for!” Andrew says. “Give me the Bacon Horseradish on a biscuit topped with bacon bits,” Justin says. “Jalapeno Cheddar every time for me,” Dale says. I’m guessing everyone has their own dip preference. 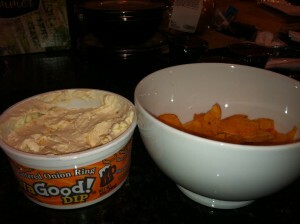 Mine is the Beer Battered Onion Ring Dip, using BBQ chips to get a load on! It’s the creamiest dip I’ve ever tasted! Then we start talking about creative things to do with Heluva Good Dips. Yes, this is now a dinner party conversation! And so it went on! Recipes and ideas with Heluva Good for about an hour! And by that time, we had dipped in celery and carrots and chips into our tub of Beer Battered Onion Ring Dip, and we weren’t hungry for apps or salad or dessert. And that evening will be forever known as the Heluva Good Evening. Afterwards I checked out the Heluva Good website and it has even more ideas for how to use the dips in all sort of recipes! I guess there’s another dinner party on the horizon! On a side note, this dip is high in calories, so if you are counting calories then caution is advised, cos this stuff is addictive! You know that 20% treat you allow yourself? This is it!